Your Bali water sports 3-in-1 adventure package includes underwater scooter riding, fly fishing and jet skiing. Enjoy a water and marine activity for all members of your family. Open up the incredible underwater world of the Indian Ocean by scooter. Admire the amazing view on the island of Bali with fly fishing and jet skiing. Your tour will start in the morning. Our driver will meet you in the lobby of your hotel and bring you to our office where you will receive instructions, a briefing and sign insurance papers, which requires only a few minutes. 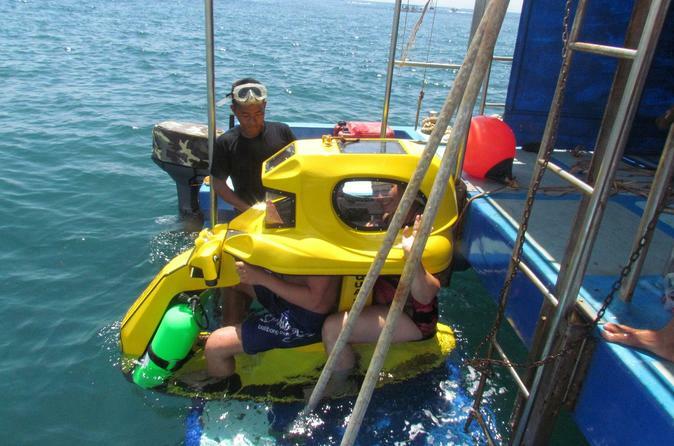 Change clothes and transfer by boat to the dive point. It takes 10-15 minutes. Dive point in the area of coral reef, where many coral fish live and where our pontoon is located. On the pontoon you will receive final instructions from our divers and embark on an unforgettable trip under the water of the Indian Ocean. Spend 25 minutes fascinating traveling underwater in an easy-to-use underwater scooter. Oxygen is injected straight into the helmet, so you can breath without any equipment. Your scooter travels under water in different directions at a depth of 6.5-feet to 13-feet (2 to 4-meters). For maximum safety of our guests only two bikes dive at the same time. Each bike is for 2 people. Additional safety will be provided by our experienced instructors. After underwater scooters riding you return by boat to the beach where you will be able enjoy 10 minutes fly fish and have fun with 15 minutes Jet Ski riding.One of the most unusual water entertainments in Bali. Everybody will be happy to try it as a family activity. During these entertainment our experienced instructor always will be with you. After you return to our office where you will be able to take a shower, change clothes and our driver will drop you off at your hotel.